The survey demonstrated 71% of voters overviewed showed they casted a ballot yes to expelling the reference to impiety from the Irish Constitution. It additionally recommended Mr Higgins got 58% of first inclination cast a ballot. Tallying of tallies will start at 09:00 BST. 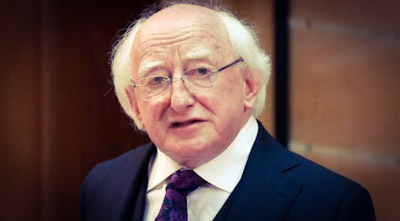 The official outcome, expected on Saturday evening, will be declared at Dublin palace.Mr Higgins is the main officeholder in 50 years to confront a test in his offer for a second term.The leave survey by Irish Broadcaster RTÉ, led by Red C, likewise said in regards to 2% of individuals who casted a ballot in the presidential poll said they had not casted a ballot in the irreverence referendum.Turnout was accounted for to be low in numerous territories of the nation. The figures propose it could be equivalent to the last Presidential Election in 2011. In excess of 3.2m individuals are qualified to cast their polls in the race and submission.Voters got two vote papers at surveying stations.They were given a white vote paper for the presidential decision and a green ticket paper for the choice on irreverence.Many were ignorant there was such an offense until the point that an individual from people in general alluded questionable comments made by the performing artist and essayist Stephen Fry on a RTÉ program to A Garda Siochana (Irish police). Mr Fry talked about what he viewed as God's mercilessness amid the program. Be that as it may, the issue was dropped when gardai (cops) could locate nobody who was annoyed.The last individual to be arraigned for impiety was in 1855 when the British ruled Ireland. Gavin Duffy, a previous supporter who currently functions as a representative in the interchanges businessDiminish Casey, a Londonderry-conceived businessperson and who made his fortune abroadThe three representatives were all "mythical beasts" in the Irish form of the Dragons' Den TV program. Around 3,470 individuals were met for RTÉ's leave survey on an arbitrary premise outside 138 surveying stations somewhere in the range of 07:00 and 21.30 on Friday.The survey recommends that representative Peter Casey will get 20.7% of the principal inclination vote with Sinn Féin's Liadh Ní Riada getting 7.4%, with 6.3% for Senator Joan Freeman. The survey recommends specialist Seán Gallagher is on 5.5% and representative Gavin Duffy on 2.0%.The leave survey's room for mistakes is between give or take 3%.